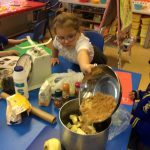 We are very proud to say that here at St. Peter’s Catholic Academy we have been awarded the Bronze Award in our Food for life commitment. We are currently working towards our Silver award please click on the link below for more information about the project. 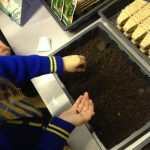 Each class has chosen a herb or salad leaf to grow with the children. 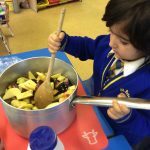 The children will be actively involved in caring for the produce in preparation for our Christmas food fayre. These children are growing basil and coriander leaves. 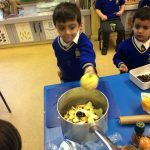 We want to be able to use these in our cooking at school but also for continued growing and consumption in the children’s homes. We have also made a link with Middleport allotment. 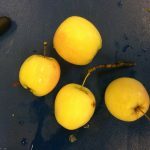 We have been allocated a plot which we will be able to grow our own produce and use back in school for consumption. The food nutrition group will be the first to visit and help out in the allotment learning about growth and sustainability. They will visit on Wednesday 21st November. This gives you a great opportunity to come into school and eat with your children and sample food that your children eat on a day to day basis.